New York: Henry Holt and Company, 1921. First edition of the 1921 edition of this collection of poems, which features Frost's, "The Road Not Taken." Octavo, original cloth, tissue guard. 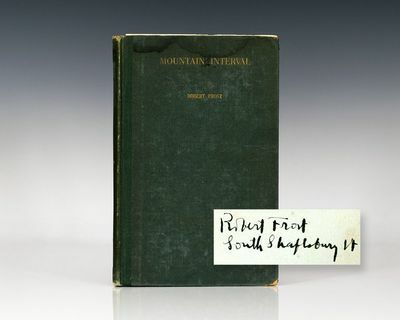 Signed by the author on the title page, "Robert Frost South Shaftbury VT." In very good condition with some rubbing. A book full of rich contrast, clarity of vision, human appeal and sharp revelation of character" (New York Times), Mountain Interval features some of Frost's finest verse, including "The Road Not Taken," "Birches," "'Out, Out--" and "The Sound of Trees." First state, with the sixth and seventh lines on page 88 both reading, "You're further under in the snow--that's all--," and the twelfth line on page 93 reading, "When I told her 'Come" (Crane A4).